Ceremony dedicated to opening of construction of 11,5 km Samtredia-Grigoleti four-lane highway took place today. Construction was opened by Vice Prime Minister and Minister of Economy and Sustainable Development of Georgia Giorgi Kvirikashvili, Minister of Regional Development and Infrastructure of Georgia Elguja Khokrishvili and Chairman of Roads Department Davit Shavliashvili. Representatives of Donor organization - European Investment Bank (EIB) and Ukrainian Altcom Company attended the ceremony. Samtedia-Grigoleti road is one of the important sections of the main transit corridor – E-60 highway. Construction begins at the first stage (Lot I), length of the section to be constructed – 11.5 km. It should be mentioned that 80% of manpower engaged in the project are locals. Project envisages construction of four-lane asphalt-concrete road with new alignment, arrangement 26 underpasses, culverts and 8 overpasses including 3 bridges and 1 railway overpass. Samtredia-Grigoleti road (Lot I) runs through Samtredia city and villages of Samtredia Municipality: Tolebi, Gormaghala and villages of Abasha Municipality: 1 May, Gautskinari. Construction of Samtredia-Grigoleti highway is implemented by the order of Roads Department of Georgia. New road shall reduce length by 45%. Movement shall become comfortable, safety level would be improved, transportation costs would be reduced and transit would be simplified. Donor of the project is European Investment Bank. 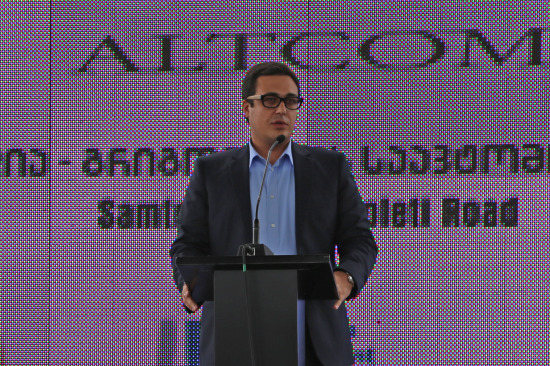 Works are implemented by Ukrainian Company Road Building Altcom, which won the tender. Contract cost is GEL 153 mln. Contract duration – 30 months.